Galileo, even after 350 years of his death, is still considered as one of the greatest scientists of the world. He was the first man to disprove many old notions about nature and to use modern scientific methods. He was born in the town of Pisa, Italy, in 1564. His father was a merchant and taught music in his spare time. Young Galileo was a talented boy, interested in music and painting. He used to make scientific toys in his childhood. He was a keen observer. Galileo studied at the University of Pisa. When in an evening he went to chapel to pray, it was getting dark and the caretaker was lighting the candles in candelabra which hung from the roof by a chain. When he released it, it started swinging to and fro. Young Galileo observed it keenly and noticed that with each swing it covered shorter distance. Galileo felt that although the distance of the swing was becoming less and less, yet the time taken in each swing was the same. There was no watch during those days. It was a problem for him to test his idea. Immediately an idea flashed in his mind. He knew that the beat of human pulse is fairly regular. He felt his own pulse and then counted the number of beats for each swing. To his great delight this observation seemed to indicate that his idea was correct. This discovery was used 60 years later in making the pendulum clocks. At the age of 23 Galileo became Professor of mathematics at Pisa University. After two years of teaching he was declared the best teacher. During those days he had read in a religious book that if two bodies of different weights are allowed to fall simultaneously from the same height, the heavier body will hit the ground first. He proved this statement to be wrong. From the leaning tower of Pisa he dropped two spheres, one of 100 pounds and the other of 1 pound simultaneously. This great experiment was seen by thousands of people. It was highly surprising to everybody that both the spheres hit the ground at the same time. 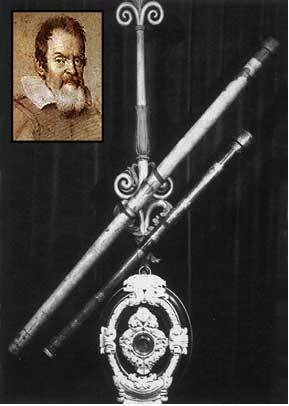 Galileo made the first telescope of the world. He observed many heavenly bodies through it. With his telescope he saw the satellites of Jupiter and studied many stars of the Milky Way. Galileo established the validity of the views of Copernicus. Copernicus had said that the earth is not the centre of the universe but it is simply a member of the solar system. Galileo proved for the first time that the sun was the centre of universe and that the earth revolves around the sun. These views of Galileo were published in a book. His discoveries offended the leading churchmen because he had disproved many notions cherished by religious people. As a result he was put in prison. By that time he had become quite old. The authorities were willing to pardon him if he accepted that his statements were wrong. He was pressurized; Galileo bowed before the authorities and said, “I am in your hands. God only knows the truth, but I feel earth revolves around the sun.” Later in 1637, Galileo became blind and in January 1642 the great discoverer died.